^ It's great that you have done what you have so far, but why get rid of that BHR midpipe?! 5k on plugs, completely fouled out.... replaced plugs, reduced premix amount, problem solved for now it seems. Waiting to put some miles on her to check and see how they are doing. Sensor in the rad overflow bottle was shot, so replaced it. Disconnected pcm to get to bolts underneath. Put everything back together and knock sensor cel kept coming on, on start up. Did EVERYTHING to clear it.. nothing. Surrendered to dealer (at $120 an hour!!) who ran a bunch of tests, one of them was the misfire count which they said was amazing, cleared it with their computer. Dealer said the BHR midpipe sounded like something was rattling inside and could be tripping knock sensor, but everything else is running great. Even tho the knock sensor code did not come back on after the dealer cleared it, I put the cat back on because I have emission testing due soon. Figured I would need to do it soon anyway.. Which has brought me to my next pain in the ***, the misfires. Maybe my PCM is just not clearing properly when I brake stomp and odometer reset thing. I've break stomped the **** out of this thing, cleared vram nram all ram, reset with AP. Nothing. Even could not clear the knock sensor code. Went back to the dealer and asked them to look at cat. They only said that I have aftermarket coils and wires, and they believe that is the problem.. I bought a spark plug tester. All coils fired up. Plugs don't look bad but I'm waiting for new ones to test.. I don't drive the car, ordering plugs from BHR trying to save some cash. But snapped this pic once I got home from the dealer, less than 10 min drive home.. I believe cats glow from misfires, then go bad. How many miles on coils & plugs? 30 k is recommended replacement time around here. -Tested coils and wires with HEI spark tester, seems to all be firing great..
-Misfires started when cat went back on. Cat has maybe 2k on it.. 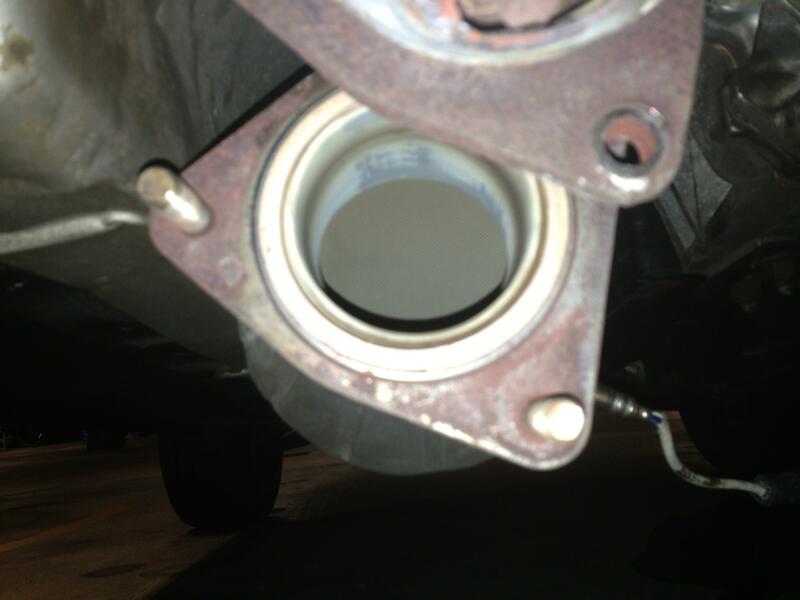 I will put new plugs in and if that doesnt cure it, i will try replacing the BHR midpipe. 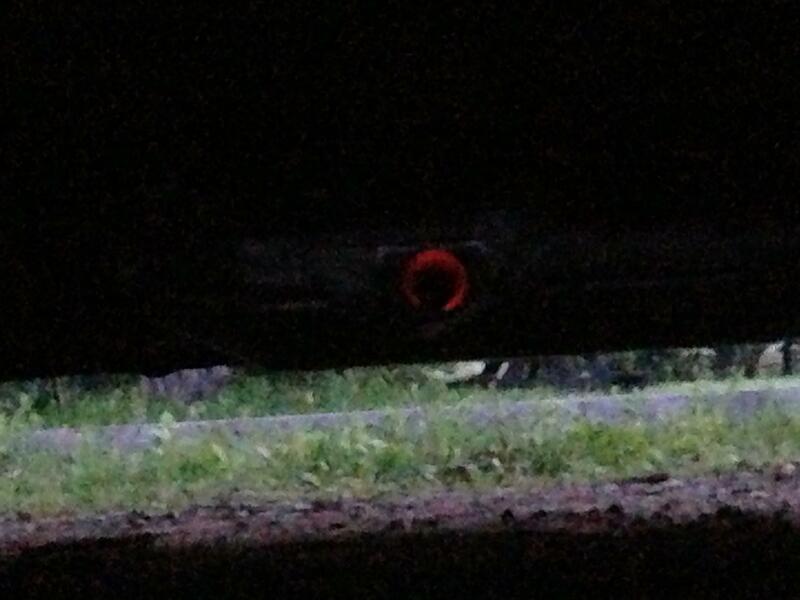 If the car does not misfire with the midpipe on in place of the factory cat, am I safe to assume the cat is the problem? Or can weak/faulty ignition systems misfire when a cat is in place, and not misfire if there is not cat?? Sorry, Yes I did scan codes. It was at first consistanly misfire in cylinder 2. Now coming up p0301, Cylinder 1. I believe that's the problem. When mine went bad, I had the 406 cat below threshold code before the misfire one. Cat could already be damaged and making it worse. I'm not an expert, just my personal experience. The misfires probably damaged the cat (it doesn't take long). If you changed the coils wire and plugs and still have a miss, I would check the air filter, clean the ess, and do the 20stomp brake reset and see how she does. Also drop the cat (front) and visually inspect it for clogging. Thanks guys, I will try all of those things and come back with update when I can. I didn't have any issues before I put the cat on, but I know it could just be a coincidence. Still curious tho if The car is misfiring will it always misfire with or without the cat?? I'm thinking a quick check could be putting the mid pipe back on and seeing if I still have misfires?? A clogged cat could cause other issues including misfires and killing your engine early. Still red hot cat if i run it hard. The cat has been damaged by your previous misfires. Solving the original misfire problem isn't going to restore the cat to healthy status. Continuing to drive on a cat that gets red hot will lead to O2 sensor failure, engine damage, and eventually a car fire. It didn't misfire before I put the cat back on, and it was on for maybe 200km's.. **** it, I'm just putting the BHR midpipe back on to drive and when it comes to emission testing time i'll just cross my fingers the cat will still pass when its on..
not the best pic, but thats what it looked like under the car.. Unfortunately, 200kms is more than enough time to fry our cats. Our cars run super rich, especially when you first start it, or do a WOT run with the stock fuel maps. Well thanks guys for all the info and advice! Jokes aside, all above advice is great. My CAT was bad, glowing red actually after a hard run. Had to gut that, replace the coils, wires and plugs. Ran great for a while, but I am paying the price now as the misfire code I was getting back then for the front rotor has finally taken a toll and now it's new engine time. I want to thank RIWWP and 1.3L(of fury) for responding to questions in this thread when I do not. So today my car just cut out a 6K RPM and engine lost all power and died. I did get the P0300 and in addtion had white smoke coming from the engine bay from the drivers side. ALso it smelt like burnt plastic. At first I thought it must be coolant but coolant has that distinct smell. This one just smelt like burnt rubber/plastic. I did change my plugs recently and was in the process of replacing my wires and coils as well. My question is does anyone the cause of the smoke? Or where is it coming from? Last edited by Unhooked; 08-10-2013 at 04:02 PM. 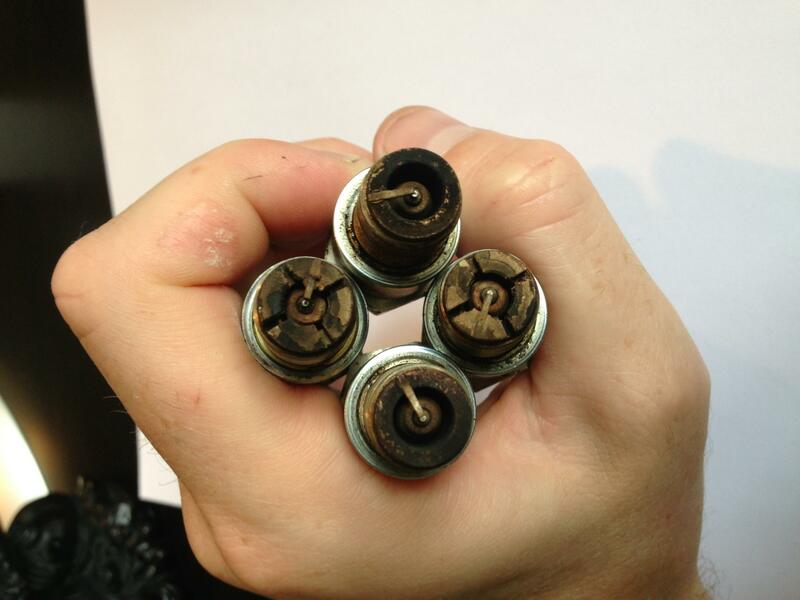 Did you remove the coils and inspect them after the smoke and burnt plastic smell? Is their anyway to get a flashing CEL, but not have a misfire? Im 90% positive my car is not misfiring, but I still get a flashing CEL it happens when my bank 3 injectors start to fire 6-6.4K RPM and only under cruise 40-60% load. No difference in engine tone, no lack of power just a flashing CEL. Thoughts, the only thing I can think of is maybe a knock sensor failure but it seems strange to only happen under the listed circumstances. Thoughts? Are BHR coils more prone to misfiring, when I put my OE coils on I noticed that although i still get a flashing CEL from time to time it is not nearly as much as when the BHR coils are on. Keep in mine Im still working on tuning and the car is slightly rich. Yes, the only way the CEL will flash is if the ECU is seeing a misfire. No other condition will trigger it. This is per the OEM documentation. Whether or not the ECU can incorrectly detect a misfire is something I'm not sure of. What variables does the ECU monitor to trigger a misfire scenario? and and calculates the misfire ratio for each eccentric shaft revolution. If the ratio exceeds the preprogrammed criteria, the PCM determines that a misfire, which can damage the catalytic converter or affect emission performance, has occurred. When the eccentric shaft position plate or the engine was replaced, the learning value for misfire determination was not initialized. So it reads the crank speed, and if its suffering a misfire it will be slightly faster or slower than what is expected. This leads to ask, what does the knock sensor even do? Also seems slightly unreliable as you are connected to the driveline which in turn is smoothing out any invariable crank differences. So it sounds like anything in the driveline that may be experiencing a balance issue would in turn be able to trip a misfire scenario.